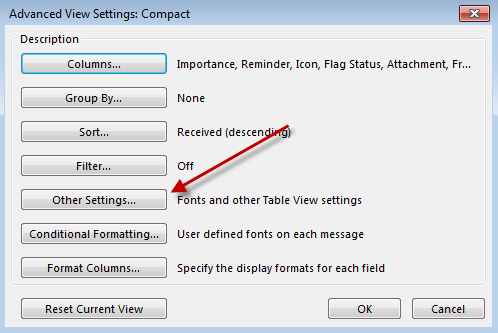 For some users Microsoft Outlook 2013 can be an adjustment from the older versions of Office. 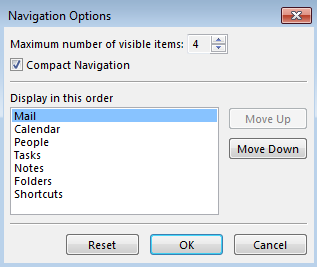 Luckily there are various customization options that can make Outlook 2013 more comfortable to use. 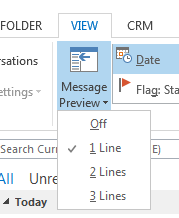 If you find Outlook is too “bright”, “white” or hard to look out you can change the theme with the following steps. Office Background changes the texture of ribbon at the top of the screen. Office Theme changes the color theme of Outlook. There are only three choices White, Light Gray, and Dark Gray. You can free up space by condensing the navigation bar. In the View tab click Folder Pane. It is possible to customize how messages appear in your inbox. For example you may find it is hard to distinguish unread emails from read emails. You can change unread emails to appear bright blue to help distinguish it from read emails. In the View tab click View Settings. 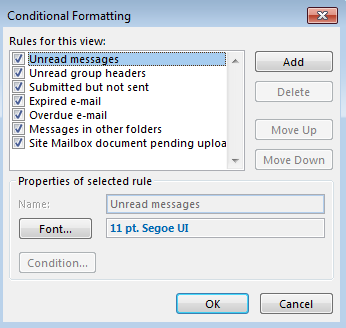 On this screen you can change the settings of existing rules such as for unread Messages or you can add a rule. 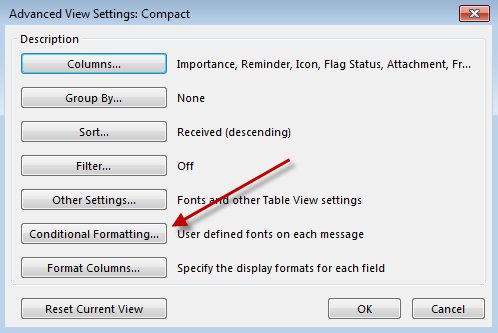 Default Outlook 2013 gives you a preview of the content of an email message in your message view. You can change this to remove the preview or make the preview even larger. In the tab View click on Message Preview. A drop down menu will appear where you can choose how many lines of preview you would like. Gridlines are the dividing lines between messages in your message viewer. You have the option of several different types of lines or no lines at all. In the tab View click on View Settings. 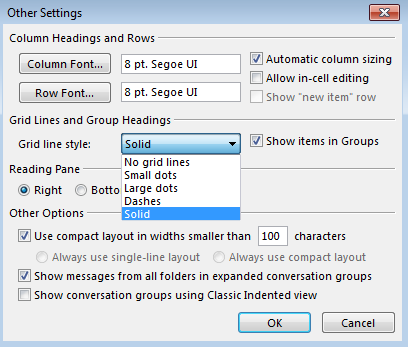 Find Grid line style: dropdown menu and select the option you would like. In the tab View click on To-Do Bar. Select what you would like displayed in the To-Do Bar.